These desk stands all had the older solid perches. The only desk stand listed with an insulated transmitter was the 20-P, which had a No. 271 transmitter. It would appear that the No. 271 was the predecessor of the No. 291 insulated transmitter listed in the 1912 catalog, and the later No. 329 insulated transmitter introduced in 1913. 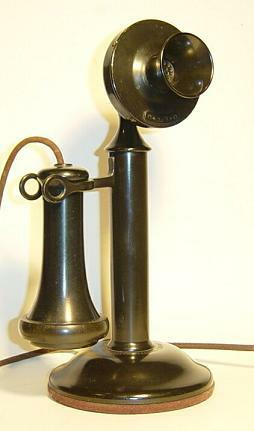 ¹Western Electric Bulletin, No. 2 (c. 1907), pp. 27-28. Series circuit desk stands were available with either a No. 293 uninsulated or No. 291 insulated transmitter, and No. 171 “magnetless” receiver. 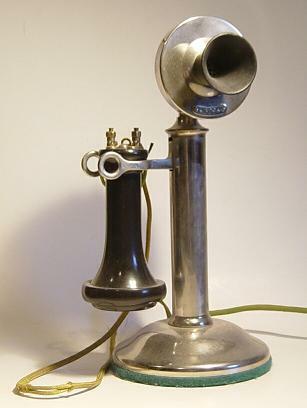 ² Western Electric Bulletin, No. 12 (Sept. 1, 1912), p. 26. During America's involvement in World War I (1917-18), Western Electric produced desk stand bases and stems out of steel instead of brass. The steel parts were given a greyish Bower-Barff (no kidding!) or "Parkerized" finish. 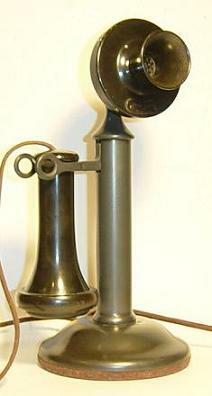 Western continued to manufacture the perches and transmitter faceplates out of brass. This became Western's 40 series of desk stands.